Sometimes you simply have to give into nature, alter course and head elsewhere than your planned destination. Last Saturday 13 July was a case in point Temptress was heading to Canna as the weather promised to be settled for a few days yet. The forecast light westerly wind was being bent round the islands of Rum & Eigg into a north-westerly whilst the favourable tide was running north along coast of Skye looming on our right. Not much tide as tides go and not that much wind but what the wind there was, was being accelerated by the mountains and, with a fetch that stretched many miles, kicking up a rough chop on the sea’s surface as it opposed the incoming tide. After clearing Loch Moidart’s rocks Temptress plugged on forward under engine at a grand 3.5 knots, each stumpy wave causing her bow to slam down into the one ahead bringing the boat to a virtual standstill. 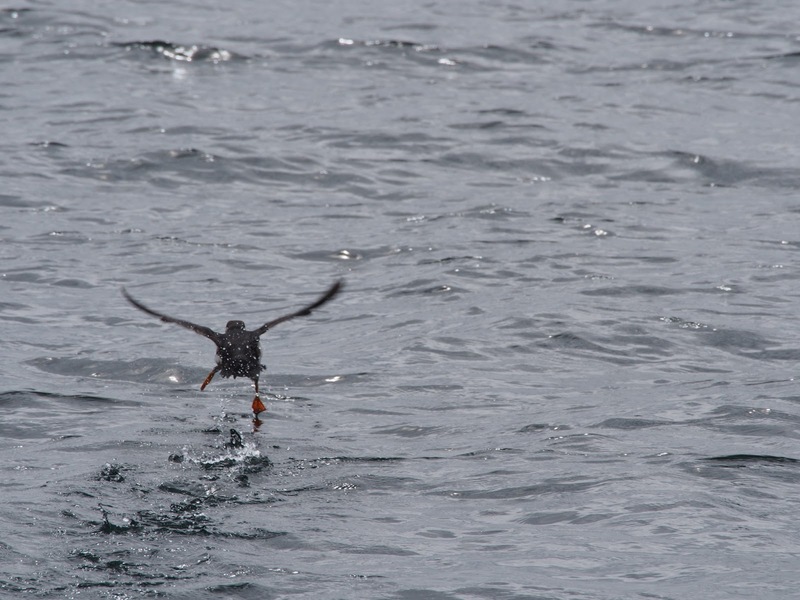 Thirty odd miles to Canna – that’s almost eight hours of bone rattling, boat shaking horrid passage making on a grey dull day which did nothing to lift our spirits. The crew ran through their rough mental list of places to see. Loch Slieve on the South East corner of Mull? A quick measure of the angle to Ardnamurchan Point, a change of course and we settled down to a fast 7 knot sail south-westwards. But did we really want to retrace our steps all the way down the Sound of Mull past Lismore and Oban? No. The crew, especially the navigator wanted new waters to explore. The wind and the forecast were good also for the fair weather anchorage of Gott Bay, Tiree so after more rapid navigation planning, thank goodness for our PC chart plotting software, that is where we headed. Wonderful sailing along the east coast of the rocky, bracken & heather covered, long thin island of Coll. Apparently there is some flat land along the other coast but neither it nor most of the island’s houses were visible from our standpoint. With flatter seas once the tide changed and a good wind we’d covered forty four nautical miles before four o’clock that afternoon to anchor off the ferry pier. The pale blue water in the bay was so clear the anchor could be seen all the way down to the bottom some seven or eight metres below the boat! A wide sweep of silver sand backed by low grassy knolls filled the horizon from the pier right round to the north east corner of the bay. There were a few houses scattered along the long shore and one big hotel about half way round, too far to consider venturing by dinghy, it would be a wet ride. Tiree is called “the land beneath the waves” and, in contrast to Mull behind us, only two points on the island could be considered as high, the rest is just a few metres above sea level, grassy sheep grazing. Ashore after a visit to the Co-op who appears to have a monopoly on island food stores and well stocked they are too, we stopped for a swift one at the Scarinish Hotel. The bar had seen better days with its formica topped tables, greasy banquette coverings and rather grumpy barmaid but the locals seems welcoming enough once they’d found we were not motor-homers (no idea why they were so prejudiced against them but they were). If you intend to visit these parts do ensure you sign up with either O2 or Vodaphone – the newly combined might of T-Mobile and Orange doesn’t reach these parts and nor it seems does a BT phone box engineer, both boxes on Tiree were out of order. Kevin did manage to borrow a phone in the Tiree Co-op to leave a message for friends Judith and John who are sometimes on the island but it would have been nigh on impossible for them to contact us unless they had a VHF so we sadly missed them. Since leaving Tobermoray with its on-off wi-fi, usable only if you sit in the little gazebo at the top of the pontoon access ramp, and extremely poor T-Mobile connection, Temptress has had to rely on Coast Guard broadcasts for weather so we now can only plan 24 – 48 hours ahead. Radio Four’s morning inshore forecast at 05:25 is simply too early to get up for but the CG handily broadcast at 07:10 so the alarm is set for five minutes before! We are collecting Coast Guard stations we have heard like postage stamps; Stornaway, Belfast, Malin Head and yesterday Liverpool speaking to an inshore life boat. The coast guard up here make a single announcement in turn on each of their different aerials of the channel they intend to broadcast the maritime and safety message on. If you hear the announcement then that’ll be the channel you’ll hear the forecast on. Much more useful that Solent CG who have taken to announcing a litany of aerials and channel numbers relying on the listener to work out which they are closest to, fine if you are a local but if not then you are left skipping through the channels to find out which works for current your position. After a night in Tiree the weird outlines of the Treshnish Isles (mostly pancake flat with a conical bit in the middle of the appropriately named Dutchmans Cap) and the caves of Staffa beckoned. It was a lazy slow sail downwind with just the jib but a great speed for mackerel fishing, though we only managed to find one, now gutted and stowed in the fridge. Off Staffa we joined the tripper boats and some other yachts taking advantage of one of those rare days of the year when boats can get close to the island. 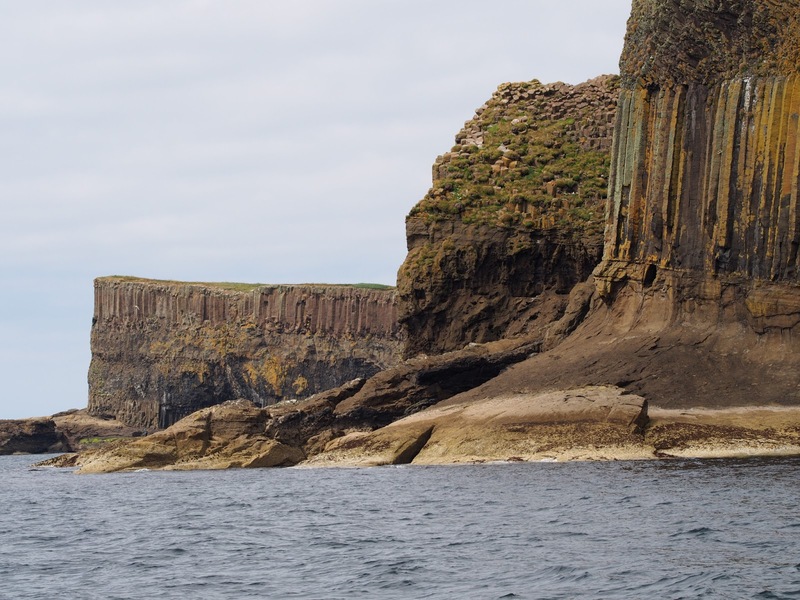 There was little swell so one tourist boat safely offloaded its customers at the jetty to walk round the rocks into Fingals Cave inspiration of music of the same name. 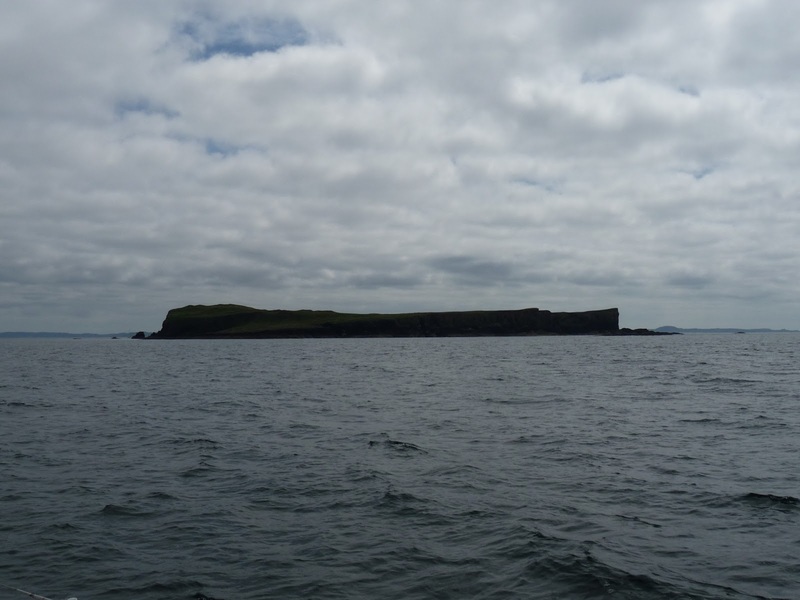 One yacht had launched a rib so all their crew bar one could go ashore and were standing on the islands peak. 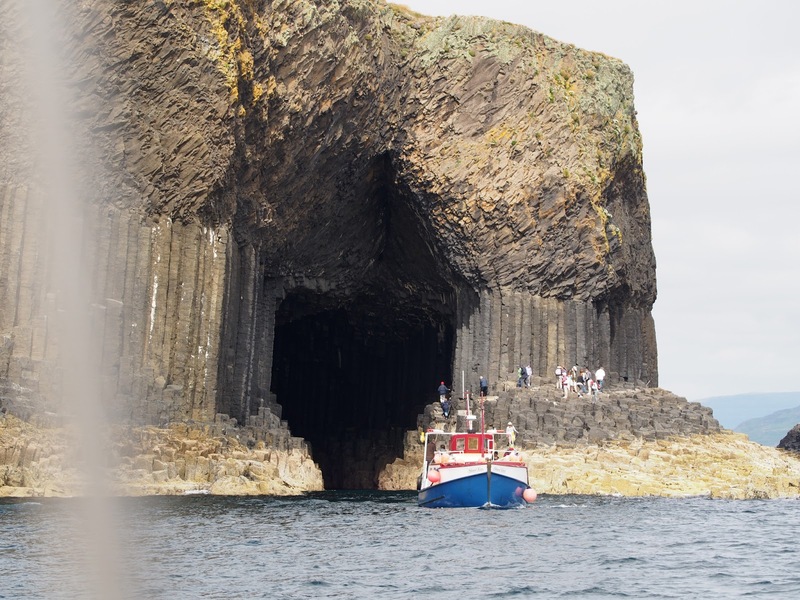 We ventured in as close as we dared for photos of the basalt columns whilst a motor boat took its passengers right into the mouth of the cave. An amazing experience and another unique opportunity for photographs and a memory that we’ll recall warmly in years to come. Then we sailed on south into Loch na Lathaich, a tiny U-shaped dent in the north coast of the Ross of Mull to the east of Iona. Described to us as popular and one of the busier anchorages around Mull we were surprised to see that late afternoon there was just one yacht on a mooring half way down and another at anchor off the jetty closer to the village. Our arrival though seemed to be the start of a minor rush hour, soon we were one of four yachts in our part of the bay and there were a much larger number clustered close to the moorings. Ashore the pleasant Argyll Arms Hotel in the village was a total contrast to the Scarinish, modern, bright and fresh with friendly welcoming staff and the food smelt good too. We decided to try their lunch and exploit their internet connection tomorrow!